I’m hitting the end of week 6 of my meditation study and I think I’m finally experiencing a bit of traction in my practice. (I was so excited about the meditation techniques we learned, I haven’t been tempted to skip at all!) This past week’s class taught us a variety of new meditations, or rather, new anchors on which to focus since the objective is the same with all the meditations—calm the mind and train it to not be so reactive to thoughts, emotions, and situations. We’re being taught so many different paths/techniques because everyone will “click” with something different and the point is to walk away with something we want to continue for the rest of our lives. I allow myself to be imperfect. I allow myself to make mistakes. I allow myself to be a learner in life. Similar to Metta, the idea is to work with yourself first, cultivating self-compassion because otherwise, we just fall back into the all-too-prevalent pattern of always giving until we’re depleted and there’s nothing left to give. Instead, this works to shore you up, create an inner strength based on compassion before sending compassion out to others. When you’re ready, you turn the phrases toward those who might be challenging to you. To give oneself permission to be imperfect, to make mistakes, to be human is powerful. 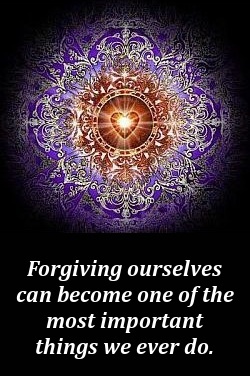 Forgiving ourselves can become one of the most important things we ever do. Because if we do, then we give ourselves permission to be authentic, to expressly be who we truly are … the masks come off, and the chains that bind us begin to unwind. We can begin to feel, to be vulnerable, to be present to life and to those in our lives. The reality is life is messy and imperfect and when we try to pretend otherwise, it usually hurts. When I started the Karuna practice, repeating the self-compassion phrases felt like having my Mother rub my back when I was ill as a child; it was lovely and comforting, and I did so for quite a bit of time. I then decided to try focusing those compassion phrases on a few others in my life and it was like a dam finally being broken—it provided such a release of old hurts that I found myself sobbing while a well of love was opening up in my heart. The combined forces of compassion and forgiveness gave me a gift I couldn’t have anticipated. I will keep working with both Karuna and Metta because these meditations will help me remember one doesn’t grow and learn when everything is perfect. The lessons and growth come from mistakes, from picking oneself up off the ground, brushing off the muck, bandaging up the wounds, and then figuring out how to keep on going in a way that better serves. If we’re present and willing to show ourselves compassion, then we’re not as likely to make the same mistakes. Instead, we grow and move forward. How much better would our lives be if we could regularly view ourselves and others through the window of compassion? How much easier to learn those lessons without the internal resistance and berating of ourselves? How much more rich could our lives be? How much more authentic? How much more loving? 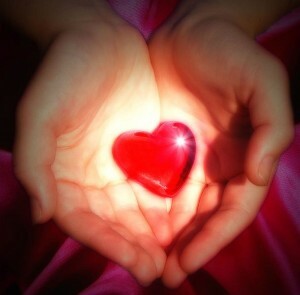 Have you practiced a heart-based meditation? What was your experience?